KentOnline talked to Show Racism the Red Card coach and education worker, Paul Mortimer about the recent landmark tribunal involving former Gillingham player Mark McCammon and Gillingham FC. The tribunal found that the club had unfairly sacked Mark due to race discrimination. An anti-racism campaigner has praised a landmark tribunal case against Gillingham - claiming it could encourage others to come forward. 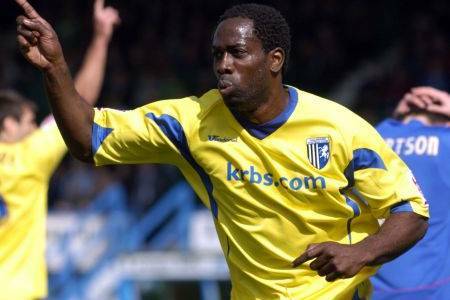 Ex-Charlton, Crystal Palace and Aston Villa player Paul Mortimer was speaking after an employment tribunal ruled a former Gillingham FC player was unfairly sacked because he is black. Ex-striker Mark McCammon took legal action against the club for race discrimination after being dismissed for gross misconduct last year. The 33-year-old claimed the League 2 club docked his wages, refused him treatment for an injury and fined him for not turning up in heavy snow. He alleged he and other black players were treated differently from white players in the first race case a footballer has ever brought before an employment tribunal. Now McCammon's case against his former club has been upheld by an Ashford employment tribunal, which decided he had been dismissed as an act of "racial victimisation". Mr Mortimer, who works as an educator for the Show Racism the Red Card charity, said the case could be a game changer. He said: "I experienced it (racism) a lot but, unfortunately, in the years that I played it seemed to be acceptable. "Thank God now it’s not, so these kind of things will be taken seriously and it should give people the confidence to speak out about it." He said the hearing would make people take responsibility for their behaviour and understand that "certain things like this are unacceptable." He added: “I've been in dressing rooms where I'm the only black player and there is a black joke going around – ‘but it's only a joke’ – it’s not serious’. He said he had spoken to Mr McCammon, who was really pleased to have been believed. A statement issued on behalf of McCammon spoke of his relief and delight at the verdict. McCammon's barrister Rad Kohanzad said: "Usually, most disputes between club and player are dealt with by the Football League or the Football Association internally. "However, this is the first race victimisation case that a footballer has brought before an employment tribunal, in a public forum. "The employment tribunal unanimously found that the club racially victimised and unfairly dismissed Mr McCammon and that some of the witnesses who gave evidence against him colluded in preparing their statements." The Gills, who strongly denied the allegations, have released a statement saying they are "hugely disappointed" and "staggered" by the decision and will be discussing the judgement with their lawyers. The statement read: "As an organisation we are an equal opportunity employer and do not discriminate against, nor victimise our staff. "This case is the first of its kind to be brought against the club in its entire history, a history that has seen the club employ many thousands of staff of various race, religion and creed, none of whom have ever felt the need to bring such a claim." McCammon, a former Barbados international, became the highest paid player at the club when he signed in 2008 - before being sacked for gross misconduct in 2011. He took the Gills to a four-day tribunal for unfair dismissal, race victimisation and failure to pay wages. The tribunal upheld claims of race victimisation by dismissal, unfair dismissal and unauthorised deduction from wages. It did not uphold a claim of race victimisation by detriment - a legal term for when someone is treated unfavourably because they have made a race discimination claim, aside from dismissal. The tribunal has reserved its decision on compensation until a hearing scheduled to take place on Friday, August 10.